As part of his six-day visit to the U.S., Pope Francis addressed Congress Thursday on a number of social issues to include global arms sales, but largely skipped over gun control. Francis, who has used a Gibraltar-born monsignor to translate for him on his trip, slowly read his prepared statement in strongly-accented English to a joint meeting of Congress, using his hands to accent his remarks. Francis invoked four Americans, Abraham Lincoln, Martin Luther King, Dorothy Day, and Thomas Merton; the latter two important but relatively obscure figures in American Catholicism, and urged a dialog to better emulate their works. Saying that, “our world is increasingly a place of violent conflict, hatred, and brutal atrocities, committed even in the name of God and of religion,” he decried ideological extremism and fundamentalism. On the subject of the global arms trade, the pontiff did not mix words. Moving onto other social issues, Francis urged more steps to be taken in the fight against poverty and hunger, called for environmental preservation, and working for the common good. 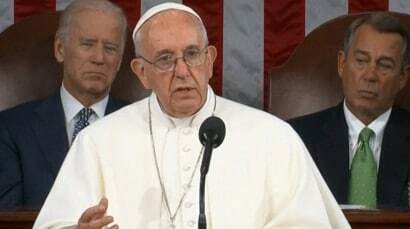 Reportedly, 31 percent of the members of Congress are Catholic to include Speaker of the House John A. Boehner, R-Ohio, who held a private meeting with Francis just before the pontiff’s 50-minute speech, the first by a pope to Congress. Within hours of the papal speech, four different gun control groups were circulating memes featuring a quote from Francis, though without the broader context in which it was delivered. Regardless of context of the pontiff’s words on the arms trade, domestic gun control groups such as the Coalition to Stop Gun Violence promptly jumped on the remark and posted it across social media. Former U.S. Rep Gabby Giffords’s Americans for Responsible Solutions turned the two sentence excerpt into a meme as did Everytown for Gun Safety and Moms Demands Action without the qualifier of the broader context in which the remarks were delivered. Not to be outdone in the papal meme department, five hours after their original post, the CSGV changed their Facebook cover photo to an approximation of the three posted earlier in the day by their rival gun control organizations. As for gun rights pundits, they too fell into the trap of judging the Pope’s remarks solely on the arms trade mention, but quickly self-corrected. National Rifle Association commentator Colion Noir at first blasted Francis on social media, then within hours corrected himself and issued a clarification after studying the religious leader’s full speech. “My initial reading of his statements were under the impression they were in full context. I was wrong,” Noir posted. “I don’t believe this exact comment was directed toward ‘Responsible Gun Owners.’ I Believe this statement was directed toward malicious Global actors who purposely sale weapons to bad actors knowing their intent. To me, this is no different than me privately selling a gun to some one I know is a violent felon,” said Noir.